Steak soup is an exceptionally hearty soup boasting a rich beefy flavor. Grab extra dinner rolls because you are going to want to sop up every last drop of this luxurious broth! Sometimes nothing can beat the flavor of a big juicy steak, other times you are craving the comforting slurps of a luxurious hearty soup. 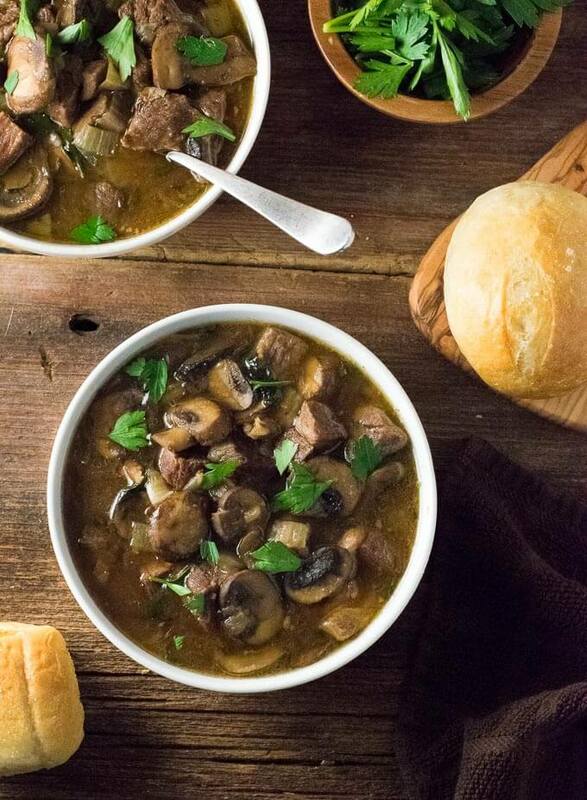 Ladies and gentleman, this steak soup recipe gives you the best of both worlds! I don’t want to say this is the best soup ever because that would be really arrogant, so I will just think it instead and hope you can telepathically pick up my vibes. Cubed chuck roast is the secret to this recipe. Yes, since this is “steak soup” you could use a more expensive cut of steak like ribeye, but what is the point? Chuck roast already contains the proper amount of fat and during low and slow simmering session the once tough cut of beef will render into mouthwateringly tender morsels, every bit as tender and flavorful and the far more expensive cuts of beef. Use the money you just saved on an expensive steak to buy yourself a nice bottle of wine to pair with dinner. To extract maximum flavor into this soup you will want to brown the beef on all sides. Crank the heat of your pot or Dutch Oven (affiliate link) to medium-high heat and let the beef sit without stirring for a few minutes to give it time to brown properly. Once one side is browned, stir the beef and repeat with the remaining sides. Sometimes I even add a splash of oil to assist with the browning process. The broth of steak soup is fortified by the fat rendering out of the chuck roast, while a simple roux is used for thickening. A roux is a mixture of fat and flour that is cooked together until the raw flour taste is cooked out. A roux is a phenomenal thickening agent for soups. However, ensure you continually stir the roux to prevent the flour from burning or your soup will taste like an ashtray…. mmm! Stout beer provides a nice deep background flavor in this soup. However, if you are opposed to using alcohol you can omit it entirely. On the flip side, you can get creative and use different forms of alcohol as well if you wish. Instead of using beer, red wine, brandy, or bourbon whiskey would all be great substitutions. Instead of 1 cup of beer, I would use 1/4 cup of the liquors or 1/2 cup of the wine. Beyond steak and beer, there are other major flavoring components that can be customized in this recipe. 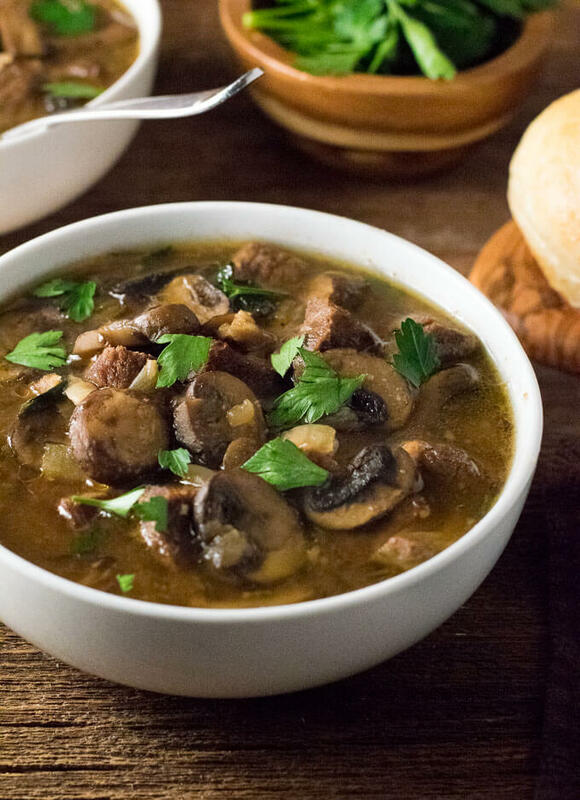 Mushrooms provide a nice hearty addition to the soup, however, they can be removed if you hate mushrooms. The same can be said with onions, they provide a great background flavor, but after the long cooking session, they provide less substantial texture than the mushrooms. Other additions you could add to the soup include noodles, a bit of tomato paste for umami flavor, or even a tablespoon of steak sauce. Soups are great because of the endless customization they provide! Like many soups, steak soup tastes better when stored in the refrigerator overnight. The reason for this is because the flavors are given more time to meld together. For the best flavor, you will want to store the soup in an airtight container to prevent other odors from the refrigerator from penetrating the soup and altering the flavor. Steak soup is an exceptionally hearty soup boasting a rich beefy flavor. Grab extra dinner rolls to sop up every last luxurious drop of broth! Cube the chuck roast into bite-sized pieces. Place in large pot and sprinkle with salt and pepper and sear over medium-high heat until browned. Remove from pot and set aside. Remove the steak and add mushrooms and onions, adding oil or butter if needed. Saute until mushrooms are tender and onions are golden in color. Add garlic and cook for 1-2 minutes, until fragrant. Remove mushrooms, onion, and garlic from pot and set aside. Add beer to the flour mixture and mix to combine. Add beef broth and Worcestershire sauce, fresh thyme, and bay leaf. Add beef, mushrooms, onion, and garlic back into the pot. When ready to serve sprinkle in chopped parsley and ladle soup into bowls. 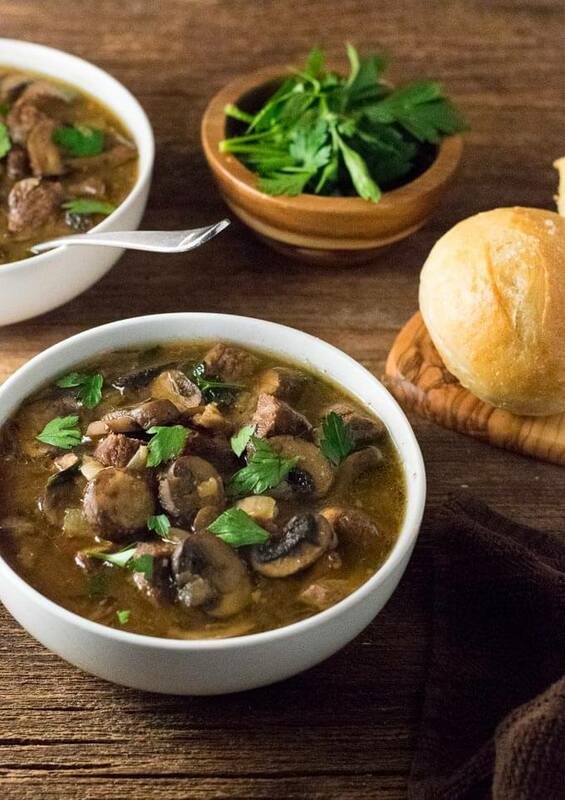 This steak soup recipe tastes even better the next day! 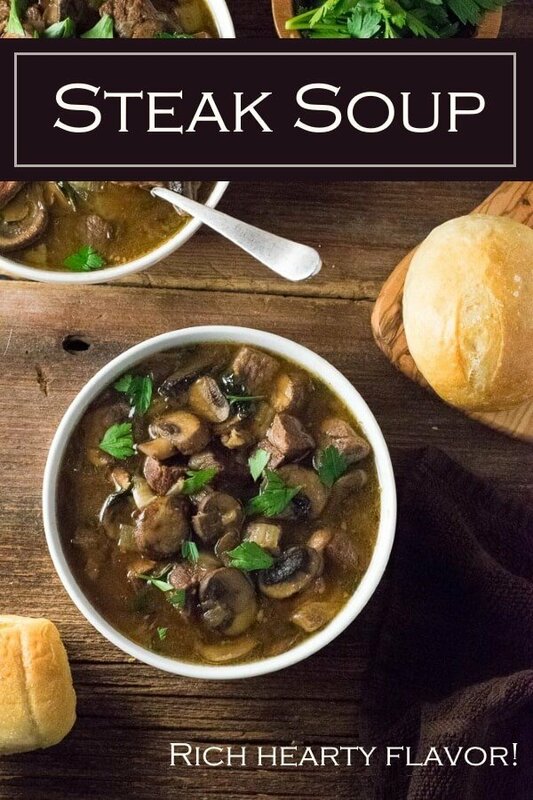 IF YOU LIKED THIS RECIPE check out my Slow Cooker Beef and Barley Soup recipe too! 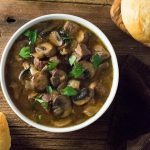 If you enjoyed reading my Steak Soup recipe then you should probably like me on Facebook and follow me on Pinterest too. That’s what I would do at least, because if you don’t get to know me but you still use my recipe it is kind of like taking candy from a stranger, and your mom taught you not to do that. Don’t disobey your mom, subscribe to Fox Valley Foodie today! This sounds and looks delicious! Gonna definitely have to give this one a try. I just ate the leftovers for lunch. You are going to love it! Great recipe. I never change up any of your recipes. But i had a huge flat iron steak i just had to use. It turned out fabulous. Used some Irish stout beer. It went over big with company, especially on a cool day like today in Door County. This certainly looks like a fantastic soup. I love that you’ve got a nice-looking loaf of bread nest to it.